After having a regular stand up vacuum for a while, most people find themselves wishing it wasn’t so hard to clean up smaller messes. Finding a handheld vacuum is the next logical step. These vacuums often end up surprising their owners with all they can do. While in search of the best handheld vac for your needs, keep in mind your budget, your typical cleaning tasks, and added features that can make your life easier and cleaning a little bit less of a chore. We reviewed dozens of handheld vacuums to identify the best of the best. We looked at every type of handheld vacuum you can imagine and listed them below. Whether you need a spot lifter, a hair remover, or a mattress cleaner, one of these handheld vacs is sure to fit the bill. For the best of the best, check out the Bissell Cleanview Deluxe Corded Handheld Vacuum. 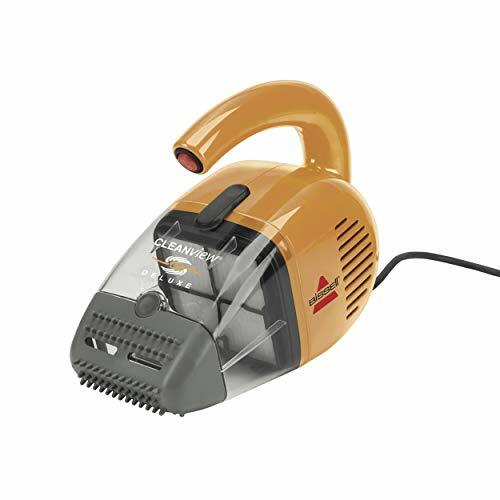 The Bissell Cleanview Deluxe Corded Handheld stood out to us as the clear winner of our top pick spot. Its compact and lightweight design will give you such portability, you’ll find all kinds of excuses to use it! Don’t judge this little powerhouse by its size! 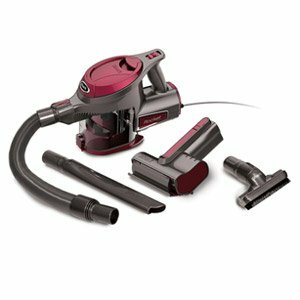 The Bissell Cleanview Deluxe Corded Handheld is a tiny vacuum but still has a 4-amp motor that will more than get the job done. Lugging this vac around is not a problem, especially with its 18-foot cord, and once wrapped up it’s only 10 x 5 x 8 inches, so it can store virtually anywhere. It comes with a rubber nozzle that’s superb at picking up hair and it has an attachment for virtually any other need you may have as well; a two foot hose that extends its reach, a crevice tool that will easily clean in between your couch cushions and a wide mouth attachment that will let you clean the stairs in only two swipes. This handheld vacuum has well over 6,500 customer reviews which is, in itself, impressive. But with those thousands and thousands of reviews, it has earned an overall rating of 4.4 stars; and that goes a long way in convincing us you’ll be pleased with this product. For a vacuum you can use for any and everything, look no further than the Dyson V7 Trigger Cordless Handheld Vacuum Cleaner. The ergonomic feel of the Dyson V7 Trigger Cordless Handheld Vacuum Cleaner just can’t be over-stated. Having a vacuum that feels good in your hand is going to make you more likely to use it. And when you’re using it, you’re more likely to use it for longer. This vac could increase the cleanliness of your home for that alone. However, it also happens to come with enough other features that mean you won’t have to use it as often. The battery life is dependent on its variable speed which can be a standard or max and go up to 20 minutes of constant use. The max power offers three times the power of conventional handheld motors and all that with a light, under 4 pound weight. You may want to purchase a few additional attachments to make it the most versatile but the motor and the power for any of those tasks is present in even the base model. With a current rating of 4.1 star on Amazon, and nearly 400 customer reviews earning it that, it’s safe to say the statistical chances of you liking this vacuum are good. And should the worst happen and this vac break on you – you’re covered under a 2-year warranty. 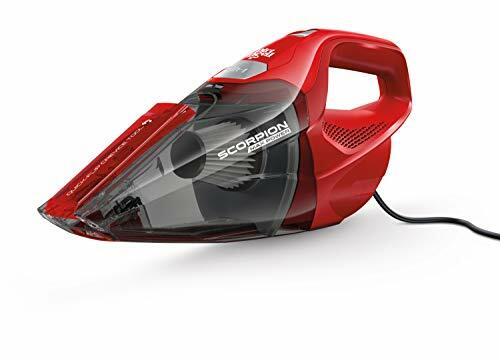 Try the Dirt Devil Scorpion Quick Flip Corded Bagless Handheld Vacuum for a handheld that will add a lot of convenience to your life without costing a lot of money. The Dirt Devil Scorpion Quick Flip Corded Bagless Handheld Vacuum may not come with a lot of bells and whistles, but it does have a simple fix for the hard to reach places. The top of the vac has a plastic extender that just flips down into place for a longer crevice tool. It flips back up and that’s it. It’s as simple as it can be, with no extra parts to lose. The 16-foot cord will allow you to travel quite a bit with this little guy, making it all the easier to vacuum up the mess and then rest of the room, should you be so inclined. It even comes with a hook and strap to secure it over you shoulder to prevent dropping. With over 3,500 customer reviews on Amazon earning it an overall rating of 4.2 stars, there’s every reason to believe this handheld vacuum will satisfy your needs just as it has thousands of other consumers. And were that enough to convince you, take a look at the price: For just under $25, you’ll have the handheld you need! If you’re in the market for a handheld vacuum that you won’t get tangled in, try the Black+Decker Dustbuster Cordless Lithium Hand Vacuum. 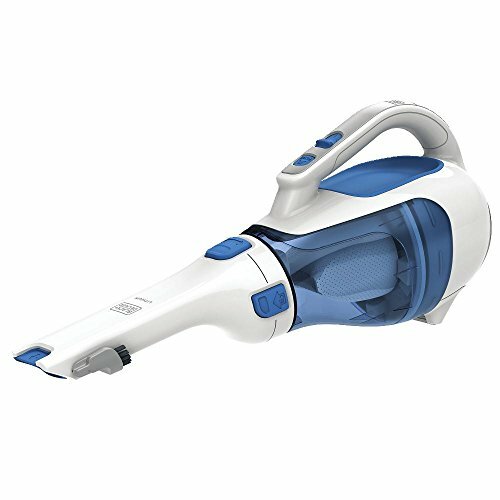 The Black+Decker Dustbuster Cordless Lithium Hand Vacuum has a nozzle extender which allows a greater range of cleanup. The bagless design lends to a fast finish; just a open, dump, and done. Weighing in at 2.4 pounds, this vac is one of the lightest on our list. Which makes it all the safer to mount its batter charging station onto the wall; mounting hardware is included. The dust bowl on this handheld is easy to clean so you can pop it out of the machine and into the sink for a fast wipe and rinse that will make it a speedy upkeep. The translucent dust bowl will allow you to see when it’s needed, as well as when you’re due for dumping the cup into the trash. Its flip-up brush is always attached and will allow you to scrub a bit for an extra-thorough clean without the added risk to lose it. This vacuum is rated overall at 4.1 stars on Amazon with well over 2,500 customer reviews. So you can buy this product with confidence in your purchase. For a vacuum that will give you all the power you could possibly need without worrying about battery life, look no further than the Shark Rocket Corded Hand Vac. The Shark Rocket Corded Hand Vac is designed very similarly to the Dyson, and while it may not have as many features, it’s half the price! For your money you’re still getting a lightweight vac with a bagless one-touch empty and a filter that is completely washable and reusable. It can clean any surface, and with it’s ergonomic hand hold and less than 4 pound weight, you won’t mind using it for any of those surfaces, either. You’ll love the 15-foot cord that will allow you to use this to your heart’s content. No matter how obsessively you clean, you won’t run out of battery life before you run out of steam. This vacuum has nearly 650 customer reviews on Amazon earning it an overall rating of 4.5 stars and that’s plenty enough to suggest to us that it’s a well-liked vacuum. But just peeking at those reviews and you’ll be sold, too: if you get this vacuum, you’ll very likely be pleased with it. If you have floors, curtains, or upholstery of any kind you’re going to need to clean it somehow. While you may be stuck in love with your standard, upright vacuum, it’s still a lot of work to move that beast from room to room – even if it’s a lightweight! You may just want the handheld for the odd job and to clean up spills and such. You can mount and hang most handheld vacuums onto a wall, so it’s particularly convenient if you purchase your handheld for a specific purpose. For example, if you want to use your handheld vacuum for the stairs, mounting the vacuum close to the stairs will make it all the more likely you will use it frequently; if you want to use it for your car, mounting it in the garage is a good plan, too. Even if you plan to only use your handheld for smaller tasks, if you are as satisfied with that vacuum as you should be, there’s a good chance you’ll stretch its use over time. In anticipation of this, try to get the version of your vacuum that has the most versatility. That is to say, if you want it for the stairs, getting a vacuum with a longer battery life and a larger dust cup will help make it easier on you when (probably not “if”) you take it elsewhere, as well. A high-quality handheld vacuum will be able to do anything that your upright vacuum can do with a simple stick attachment. In fact, you may just be able to completely replace your vacuum and find that the convenience and comfort of a handheld will keep your house cleaner because you’re more likely to use the handheld than you ever were to use your big upright vacuum. Cords. The first question you’ll want to ask yourself if you’re in the market for a handheld vacuum is how you’re going to use it and if that activity is better suited for a corded or cordless vacuum. If you’re going to use it for your whole house, particularly all at once, then you may need more time than a cordless can offer at once. However, if you plan on using it for your stairs or car, you would greatly benefit from a cordless. Fighting a cord while crawling around in your car or tripping over that cord while going up a split level is miserable. Bagless. A bagless vacuum means you won’t have to keep buying bags and that will save you a lot of money in the long haul. Not to mention that with a bagless, you’re always ready to clean. While there are plenty of reasons to go bagless, there is one big reason that those who love their bags want to keep them: Less dust and dirt. You can usually just pull a bag out and toss it without any dust or dirt particles flying back into the air and for some that is worth the extra expense. Stick. You may want a handheld vacuum, but that doesn’t mean you need to crawl on your hands and knees to operate it. The stick attachment may just make the handheld vacuum you purchase one that you use for more than just the odd mess; it may become your go-to for everyday cleaning with the stick. And who would have thought when you were lugging around that upright that the technology for a better way to vacuum was just around the corner? Weight. You may (probably) have not considered the weight of your handheld to be an important factor when purchasing the vacuum; after all, it’s designed to be hand held, it can’t be that heavy, right? Wrong. The weight of the vacuum needs to be catered to your strength. So if you plan on using this vacuum frequently, the lighter and more comfortable the hold, the more likely you are to actually use it and not just your standard twice a week type of vacuuming. What is a handheld vacuum and how does it work? A handheld vacuum is a vacuum you hold in your hand. It will operate much the same as a standard, standing vacuum but will be much more portable. It is traditionally for smaller jobs and not intended for your whole house cleaning but with the evolution and advancement of technology, you’ll find that several are just as effective as your old vacuum. You can typically get a handheld with a wide variety of attachments that make them a jack-of-all-trades when it comes to cleaning. You’ll be able to use these for your car, your upholstery, stairs, and both hardwood and carpeted surfaces. With the addition of a stick attachment, you won’t even need to bend down to do it all, either. Are handheld cordless vacuums less powerful? Traditionally, the cordless vacuums have had a reputations for being less powerful than the corded. The ability to maintain a powerful suction is dramatically impacted by the power supply. And when the power supply is a battery, there is a finite amount to go around. What good is a vacuum that won’t last five minutes, after all? Fortunately, batteries and technology have improved dramatically in even the past 5 years. Variable speeds will give you the best of both worlds: extreme suction for short bursts and prolonged, weaker suctions for your everyday jobs. A more reliable brand will utilize a more robust battery that will allow you the power you want for plenty of time to get the job done. You’ll also want to keep in mind that a powerful, corded vacuum will also use more electricity, which is a power source for which you pay – so when you only need the extra strong suction on occasion, even the less costly cordless vacs can probably save you a bit in the long run. How long does a handheld vacuum cleaner last? Not surprisingly, how long a handheld vacuum cleaner lasts depends on the make and model of your vacuum. Some high-end vacuums can last decades while the less expensive brands will die after just a few years. You can expect the life of your vacuum to also be directly affected by how well you treat it. You’ll extend the life by keeping it clean, replacing the filter when needed, empty the bag or bin regularly, and check the rollers and hose for clogs or tangles. Battery life of a cordless handheld vacuum will depend on how much you want to spend on that vacuum. You can expect even the more cost efficient cordless vacuums to have an operating time of at least 15 minutes, but a good mid to high range of up to 40 minutes. You can find a longer range of up to 60 minutes, or possibly even interchangeable batteries but you will need to be prepared to spend a little extra for those conveniences. How much dirt can a handheld vacuum hold? There’s a huge range in possible capacity for dust cups and dirt bags for handheld vacuums. As a rule, you get what you pay for, of course, but typically the dust and dirt capacity isn’t the feature that’s maximized with a jump in cost. You can expect around 2 cups for your more compact handhelds and for your larger handhelds (that will be ideal for whole house cleans) you can expect around 6 cups or so. The dirt capacity is the biggest drawback of a handheld, we have to be upfront about that. But if the dust cup is easily emptied, it really won’t slow you down too much. So if you plan on getting that handheld to use all over, also look for a fast empty dust cup. We looked at 20 other handheld vacuums. Even though they didn’t make our 5 best handheld vacuums list, they’re the best of the rest and each is still a great option for your home. The information you’ll need to compare each one is included with the listing. Although this vacuum is labeled “car vac,” that dramatically understates its versatility. You can use the 15-foot electric cord and attachments for any number of home uses. From under the refrigerator to the couch cushions, this vac can handle it all. This little vacuum easily adapts to hardwood and carpet with two different specialized nozzles. Boasting a 16-foot cord and a 5-pound weight, this vac is wonderful for moving around your room with ease. This vac has options! Whether you plug it into your car or you use a standard wall plug, you won’t have to worry about the battery cutting your cleanup short before the mess is gone. With its attachments and bag, this set makes for a complete vacuum package. Although this vacuum claims to be bagless, it does still have a collection basket. This allows for a quick clean up (take it to the outside trash so you don’t put any dust back in the air when you empty it), but when a normal bagless would need a deep scrub, this vac would just need its basket tossed in the sink for a quick cleanup. The filtration system on this vacuum includes a replaceable filter that will need replaced periodically, but you can wash the filter to extend its life. The lightweight hold makes sweeping up your upholstery simple, and the 20-foot cord means you can take it all over the room should the mood strike. This vac may require replacement bags, but let’s not undersell the cleanliness of the bag. It’s as simple as pulling a bag and dropping it in the trash, and there’s no extra dirt and dust flying back into the air after you’ve just cleaned it all up. You won’t have to clean the machine out as often, either. It may be a bit pricier, but the convenience is undeniable! This little guy has a big appeal for pet owners. The motorized brush is great for picking up dog hair and clean up is a breeze with the bagless, one-button dump cup. The 20-foot cord allows you to clean up after your fur babies in the car as well as in the home. The filter in this vac is replaceable, but based on the reviews, you may never need to actually replace it. You can simply pull it out, give it a quick wash, and let it air dry. It has a hose that can be stretched up to 3 feet for use on stairs and in your car. This is definitely the most unique hand vac on the list. It’s designed for a very specific use: The UV light and hot air work together to kill the dust mites, bed bugs and allergens that bother you without ever being seen. In case you’re worried it won’t reach all the deep down mites, the vibrating feature beats the mites to the surface. It will vacuum up as it goes, but it’s primary function is to eliminate the creatures; it’s not focused on absorbing dust. This isn’t a dual function vac, though; it’s a mattress vac. But it’s the best at its job. This vac is the perfect cleaner for the occasional spill or oops. The cleaning brush scrubs the stain with cleaner and the suction removes the stain from your carpet with virtually no fuss. If you don’t want to bother with cleaning a whole room, this is perfect. This cordless vac lets you take it where you need it. Whether you’re cleaning spilled cheerios or vacuuming your car, this little guy can do it. Its dual-filtered suction has one washable filter and one that takes replacements. Cleaning the plastic filter, though, will extend the life of the replaceable filter. This Black + Decker hand vac has an incredibly long lasting battery life. Black + Decker says it can hold a charge for up to 18 months! After use, clean up is as easy as removing the nozzle and dumping the dirt. Most handheld vacuums suffer the problem of causing back strain: you have to crouch down to use it on your floors. This vacuum has beat that problem by giving you the choice. It’s a handheld vacuum with a floor extension, meaning no more bending over to clean up messes on the floor. Don’t want to have to maintain two vacuums for wet and dry cleanup tasks? This handheld vac may be just what you’re looking for. With a simple flip-down extender, you can reach even further cleaning up your dry AND wet messes! The Shark Cordless Pet Perfect II comes with an array of attachments to suit your needs. Whether your goal is to remove pet hair or to clean up the occasional mess, this vac has you covered. You just switch out your attachment based on your specific needs. This handheld vac has all kinds of extra features. A quick recharge, a long battery life, and wet/dry versatility sets this vac apart from the rest. But you can’t ignore that this vac is quieter than most, too: 40 decibels lower! This vac is probably just the kind that comes to mind when you think of handheld vacuums. It has the traditional look but with lots of added features. The suction, for one, is much stronger than what you had as a child. With a longer battery life and crevice attachment, this is definitely an upgrade from the traditional hand vac. This little vac has plenty of versatility with its attachments. The motorized brush foot is perfect for removing pet hair and getting deep-down messes. The upholstery tool is designed for your cushions and couches and the crevice tool is perfect for getting hard to reach places like under your refrigerator. 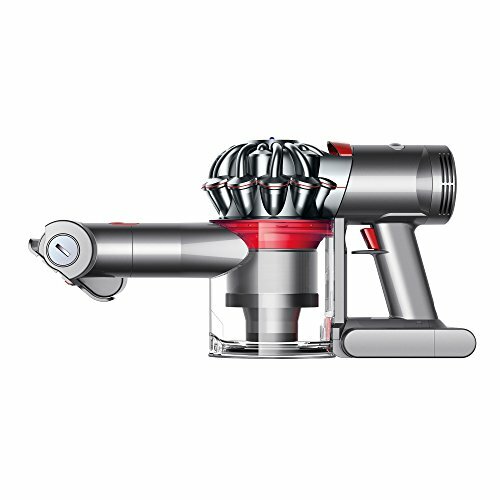 Dyson has a reputation for having the most powerful vacuums on the market. The Dyson V6 Baby even has a “Boost Mode” to increase the suction for bursts of extra suction. The battery can operate at full power for 20 minutes straight, and the bin drops dirt directly into the trash. This vacuum is the most expensive on the list, but you know what they say: You get what you pay for. This vac’s whole-machine HEPA filtration system boasts to remove 99.97% of unwanted particles in your mattress. While it’s focused on the specialized task of cleaning your mattress, that’s not all it can do. The anti-allergen machine is ideal for cleaning any upholstered furniture, or add the dusting brush attachment and use it to dust.